temperature to do so. Wahoo! is interested, I am selling it for 250$ (originally 500). inquires, please e-mail me at bsbarton@uark.edu . I agree completely! Fall is my favorite season to dress for because you can layer up on tees, cardis, dresses, and skirts :) You look amazing. I love the polka dots! i wish i could pull off over the knee socks!! 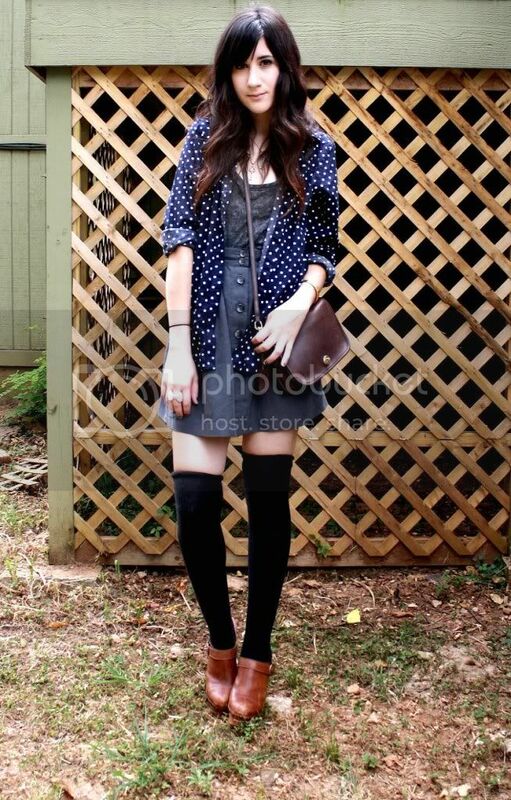 I positively adore this outfit--especially your adorable polka-dot shirt and your over-the-knee socks! Could you keep us updated if anyone offers to buy your camera? Because I'll have that money in like, two months time, maybe... If I don't eat... lol. i wish i could wear black tights but its to hor where i live, have to wait until december somtimes january. your hair always looking great! I love layering too - it's nearly spring here and I'm missing winter even before it's gone! ooo is it cooler in texas these days? i am back in illinois and it is finally a reasonable temperature! none of that 100 degree southern heat! my bf bought a pentax kx this summer and has had so much fun playing with it -- dslrs are great! Goodness Bonnie, this has to be one of my favorite outfit of yours ever! I love the layering! Eeep, I'm so excited for the fall, I've decided I need to hoard lots of tights and socks. Hah I was able to wearing knee highs all through summer in Ireland! Awesome from head to toe - seriously! I heart your style. love it! i feel you on the over the knee socks. although, i havent been able to find any. where did you get yours? I like the over the knee socks a lot! You reall rock the layering look well! I tried knee high socks before and nahhh... not good on me. xD I wish though! I like your new camera! It's great! :) I'm actually very interested in buying your other camera but I can't tell if it takes good photos because you are such a good model and you make the photos look good. xD I shall think about it some more and let you know fo sho! 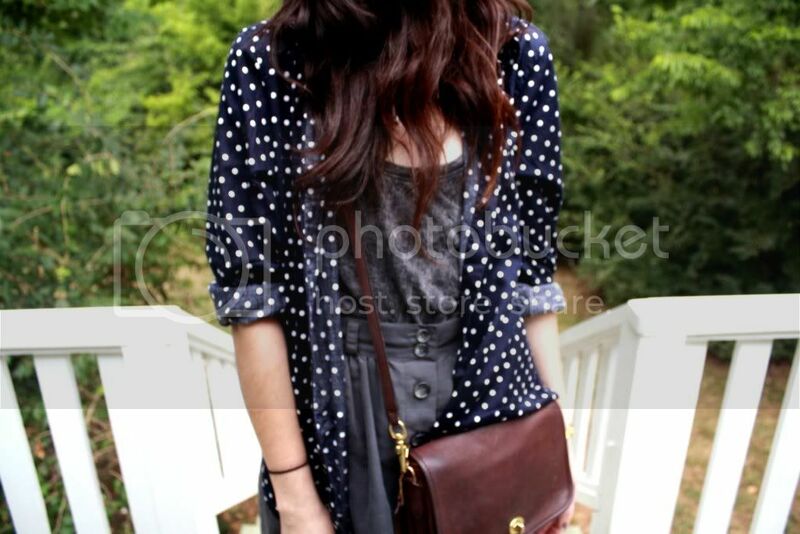 I like the polka dots, a lot :D And I'm quite the fan of layering as well. I love summer, but that's one reason why it's frustrating, cause it's way too hot for layers and all. But yeah, fall is coming up of course! it is still so hot where i live! i wish i could wear more layers but it is all i can do to wear a tank and a skirt! This is great, your style is so unique! I can't wait for fall either, to be able to mix textures and wear tights again. Ahh, hurry!! i love the overknees and the bag ! btw check out my giveaway of $100 worth of A'GACI merchandise! ends thursday. i love the over the knee socks with those clogs! Oh yes,layering is the best. Those socks look good on you and work so well with the outfit, I want to try it myself now (I've always feared knee/thigh high socks haha)! Has anyone bought the camera yet? I am very interested and have the money, but I want to research it a bit more before inquiring. you are beautiful girl. Follow my blog with you add members. I've been dying to try over the knee socks, I love the way you put this outfit together. It looks so effortless! ooo love those socks! I don't know if I could pull them off, but I may try sometime. haha! Glad you got a rebel! My first dslr was a rebel and I looooooved it! They are such wonderful cameras. Wow! there`s so many flashes of style in here I almost get dizzy. haha. really. your look is great, and you`re not alone on longing for fall. I`m going nuts this weekend for fall items. can`t wait. you look lovely and i wish i could have those clogs! SOOOOOO beautiful, you seriously inspire me! :O I have that exact skirt! Love it!!! The hole outfit is wonderful!!! Me tooo...U look so pretty as always! The knee socks look completely amazing!!! LOVE! LOVE! LOVE! You really have the layering down to an art!! Sick blog! Now following you fashionable cutie!! Love the look and I can't wait for cooler weather in order to layer too! You look so pretty. I think the socks and clogs make the whole outfit. I am in love with the whole over the knee sock trend. just as an anon reader tip... your ad.s are all really distracting,useless and annoying. it's sad youre really that desperate for personal monetary gain. What a great outfit. I love layering too. I've had no summer...so I'm looking forward to autumn styles. Your polka dot top is AMAZING! This print suits you to a T! I use a Canon Rebel right now, too! I love it. It makes everything look amazing. And so funny that you saw those youtube videos. I am usually so embarrassed to let people hear or see sing, but I do love to sing so much! And your comment really means a lot. haha. i am blushing. But I will try to get more videos up soon, but out camcorder is not working. Anyways, you look amazing like always! I love how casual the pretty polka dot shirt looks in this! wow. i'm in love with your blouse. and the way you wear your socks. U are so cute with this outfit. Been looking for a great sheer polka-dotted top like this. Great layering, the knee highs really add a great touch. You layered perfectly. Love your style and your blog. I am def your new follower. Check out my fashion blog. love your outfit! love clog with it too! I absolutely adore this look! The darker colors compliment you very well! Love the outfit! Great job putting it together. 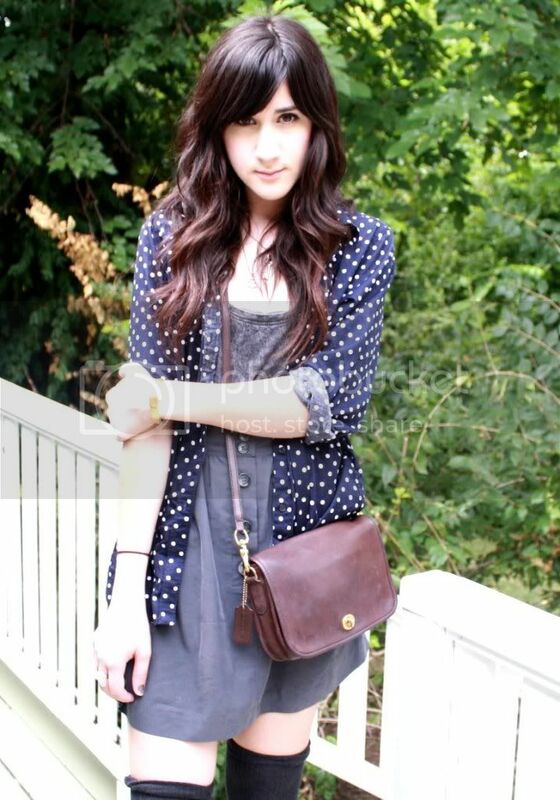 I lovelove your clothes and i could do alot to get that bag.. Haha. 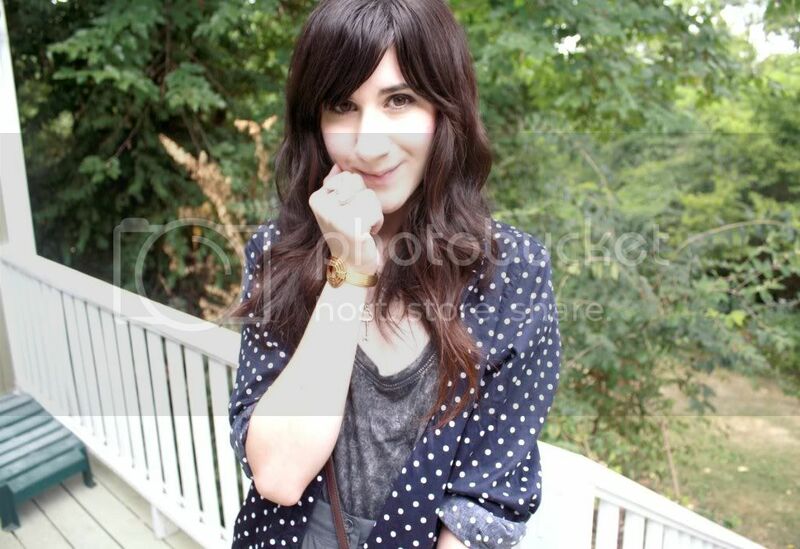 you are adorable, i'm loving your blog/style!